Last Thursday I attended with my mom to The Martha Stewart Show‘s taping of her upcoming episode about the release of her new book Martha Stewart’s Pies & Tarts. Both the book and this episode will be released/aired on Tuesday, March 22nd. 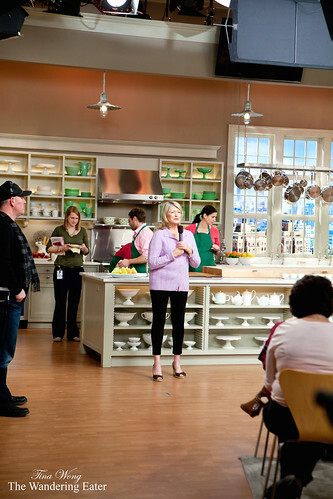 As a long-time fan of Martha Stewart (started way back almost a decade and a half ago, when I was a kid and her shows used to be syndicated on CBS), this taping would be like watching your favorite [insert person’s name and occupation] doing their work in front of you. She influenced me by getting into baking from scratch. I reached a food epiphany that it tastes better to bake from scratch after baking one of her cookie recipes, rather than store bought, pre-made refrigerator cookie dough or boxed cake mixes. Ever since then, I’ve been using her recipes pretty frequently. Heading over to the show’s studio in Chelsea, my mom and I checked in, got scanned (security is tight here), and escorted up to one of their stages by one of Martha’s interns (I found out by talking to the young lady for a few minutes). Walking in on the rehearsal of the episode, I was flabbergasted as to how many people and how much work needed to orchestrate together to make the show happen. 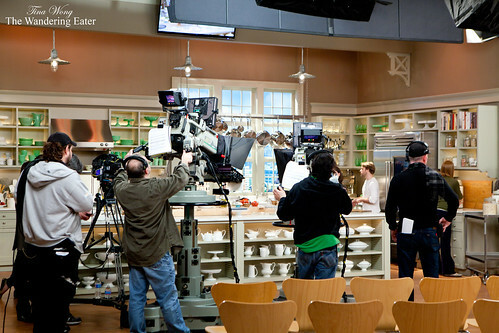 At least five bakers were prepping and baking in the test kitchen, located just a few yards off the stage. About half a dozen camera operators and a dozen or so production managers, production assistants, audio engineers, producers, a photographer, etc., all getting ready for the day’s taping of the “Pies & Tarts” episode. I’ve also noticed another team was preparing for what seems like an Easter themed show on the other end of the stage. 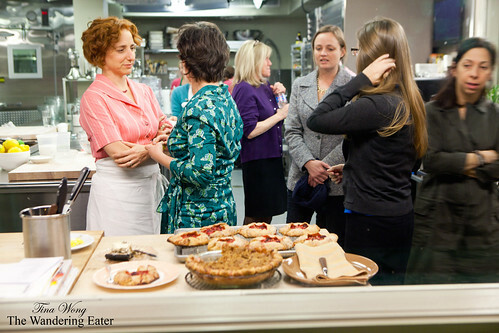 Since everyone in the audience were not allowed to take photos during the taping session, I can’t show you photos of the amazing tarts Martha and her staff members (Food Editor of “Everyday Food” Sarah Carey, Senior Food Editor of “Martha Stewart Living” Shira Bocar, and Editorial Director of Food and Entertaining of Martha Stewart Living Omnimedia Jennifer Aaronson) made while the tape was running. But watching them make all of the tarts were drool-worthy. I wanted to eat the first tart, especially – a savory galette filled with tomatoes, basil and boccaccini mozzarella. 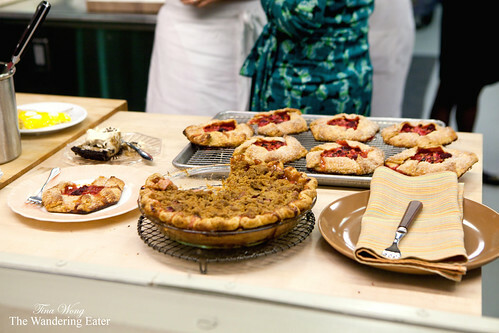 I can imagine having three meals consisting only of pies and tarts after watching the taping. Even if it does spike my cholesterol count by a couple of points, life’s too short to curtail my want (or love) of butter and baked goods. The best thing that ever happened during the taping (and possibly my life), I managed to have my photo taken with Martha Stewart in between one of the commercial breaks. In my perspective, it’s like meeting a deity. For the brief moment of shaking her hand and speaking to her, she’s a very kind woman. She even didn’t have an issue with me bringing my camera and have my photo taken it with it, despite the fact her photographer has his own camera. After that encounter, I walked (or floated?) back to my seat. I was giddy and my mind was somewhere else in a happy place for a couple of minutes. Getting back to the show… After the show wrapped up, Martha said several words of thanks to the audience and mentioned about her Pies & Tarts Pop-Up Shop this coming weekend in the West Village. Then we’re all dismissed, row by row. But before I left, I managed to get a photo of most of their tarts that’s sitting on the studio’s kitchen counter (the photo above, on the left). What’s pictured are the individual rhubarb raspberry galettes, rhubarb crumble pie, and a partially eaten slices of coffee cream pie and lemon tart. 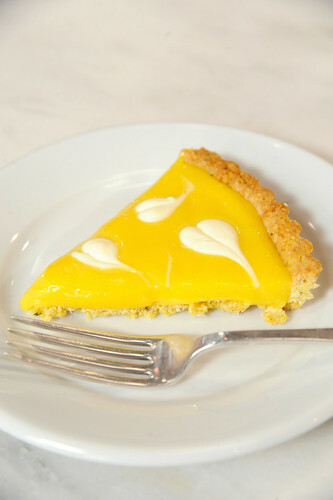 From Martha’s photographer (the photo above, on the right), David Steele, he provided me his beauty shot of a slice of lemon tart marbled in creme fraiche (the sage crust is made with cornmeal). They’re gorgeous tarts and it’s definitely tempting me to bake from her book right now – or simply making me crave a really good slice of pie. As part of their parting gift for the audience, we all have a copy of her book along with a few other goodies. The book is beautifully photographed and well written. I’m scheduling in between my writing sessions for my graduate school papers with baking tarts in the upcoming weekends. I’m excited. 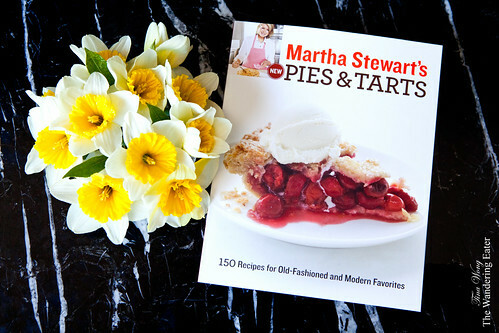 The Martha Stewart’s Pies & Tarts Pop-Up Shop (more information here) will take place at 93 Greenwich Avenue, between Bank Street and West 12th Street in NYC, on Saturday and Sunday, March 26th & 27th from 10 AM to 6 PM. Ohmygosh — Martha Stewart is royalty. I bow before the queen of home-making. You are so lucky to have met her in person! I have her baking handbook and it’s awesome. Also, your outfit is really pretty, I love your shoes! I’ve been a long time reader, and just wanted to say hi! Tiffany: Hi, Tiffany! 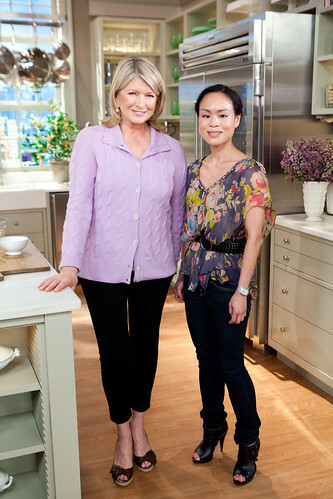 I thought I died when I was allowed to go up to Martha Stewart and shake her hand. I love her book, too, as I’ve mentioned on my post. WOW! I think its so cool that you met Martha Stewart. I found out too late about the pop-up pie shop she had over that weekend, but those pies looked divine. 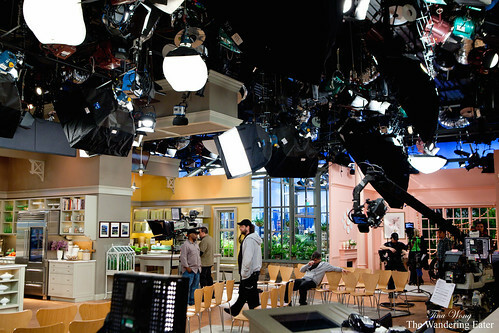 Thank you for posting those great pictures of the set and the taping. Its so nice that you were able to take a photo with her, she has always seemed like a very down to earth woman. I love her baking books, I made a lemon bar and it was amazing! I Live in New York too and I have yet to find the best lemon bar in the city. Many bakeries has featured them but there were none that were outstanding! Thanks for reading and commenting! It was surreal to meet her in person.